Being a believer does not exempt us from having conflict with others; it simply means that we have the obligation to and means by which we can resolve that conflict. At the heart of being a follower of Christ is being a peacemaker, one who seeks to make things right with those they have offended and to be at peace with all men. While this may not always be possible, the heart of a true believer is to respond to conflict in a Gospel-centered and biblically faithful manner. 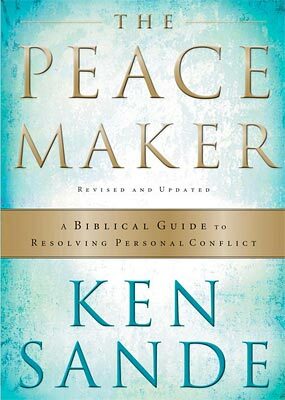 In his book The Peacemaker, Ken Sande gives practical biblical guidance for conflict resolution that takes you beyond resolving conflicts to true, life-changing reconciliation with family, co-workers, and fellow believers. Drawing on the Gospel of Jesus Christ as the foundation for true peacemaking, Sande demonstrates how churches and families can develop a “culture of peace” by identifying and overcoming the desires in our hearts that fuel conflict. Are you out of fellowship with a fellow believer? Family member? Friend? If so, then you need to familiarize yourself with the biblical principles in this book to resolve those conflicts to the glory of God and the cause of Christ!